Under the CRA, Congress has 60 legislative days to pass a resolution of disapproval to cancel a final rule published by a federal agency. Both chambers of Congress have to pass the resolution, which is not subject to a filibuster in the Senate, and be signed by the president. The CRA, which, after a rule has been canceled, prevents a federal agency from a rulemaking that is "substantially the same," was a product of bipartisan work between Sens. Don Nickles (R-Okla.) and Harry Reid (D-Nevada). In April, the Center for Biological Diversity filed a lawsuit against the Department of the Interior Secretary Ryan Zinke over a CRA, H.J. Res. 69, that canceled a Department of the Interior rule that prevented the disposal of certain predators in wildlife refuges in Alaska. Using the Supreme Court's decision in Chadha (1983) as the basis for its challenge, this radical environmentalist organization argues that the CRA is unconstitutional because it prevents a federal agency from promulgating a rule that is "substantially the same" without amending the law under which the original rule was finalized. "With passage of the Joint Resolution, the CRA now bars Interior from any future rulemaking that is 'substantially the same' as the nullified Refuges Rule. 5 U.S.C. § 801(b)(2). 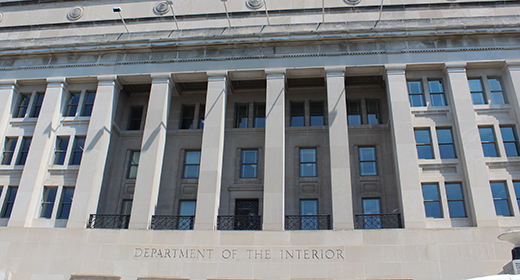 It thereby restricts Interior’s rulemaking authority without amending – through bicameralism and presentment – any of the statutes that authorize Interior to manage national wildlife refuges in Alaska," the lawsuit claims. "The CRA’s prohibition on future rulemaking 'in substantially the same form' as the Refuges Rule therefore unconstitutionally infringes on the powers of the executive branch in violation of the separation of powers." Chadha struck down a unicameral legislative veto in Section 244(c)(2) of the Immigration and Nationality Act, meaning one that passed only one chamber of Congress. Chief Justice Warren Burger wrote, "The prescription for legislative action in Art. I, § 1 -- requiring all legislative powers to be vested in a Congress consisting of a Senate and a House of Representatives -- and § 7 -- requiring every bill passed by the House and Senate, before becoming law, to be presented to the President, and, if he disapproves, to be repassed by two-thirds of the Senate and House -- represents the Framers' decision that the legislative power of the Federal Government be exercised in accord with a single, finely wrought and exhaustively considered procedure. This procedure is an integral part of the constitutional design for the separation of powers." Because the CRA is consistent with the principles of bicameralism and the Presentment Clause laid out in Chadha, the law is constitutional. The Pacific Legal Foundation has filed a motion to dismiss the Center for Biological Diversity's lawsuit on these and other grounds. " CBD’s claim that the resolution of disapproval is unconstitutional because it withdraws authority from the Department of Interior without amending the statute under which that authority was previously exercised is meritless and has no basis in the Constitution’s text or precedent," the motion from the Pacific Legal Foundation explains. The law, the motion notes, was written specifically to statisfy the Supreme Court's decision in Chadha. The case is currently pending before the United States District Court for the District of Alaska. Six of the seven judges on the court were appointed by Republican presidents. Alaska does fall within the Ninth Circuit Court of Appeals, which is known for its leftist tilt.